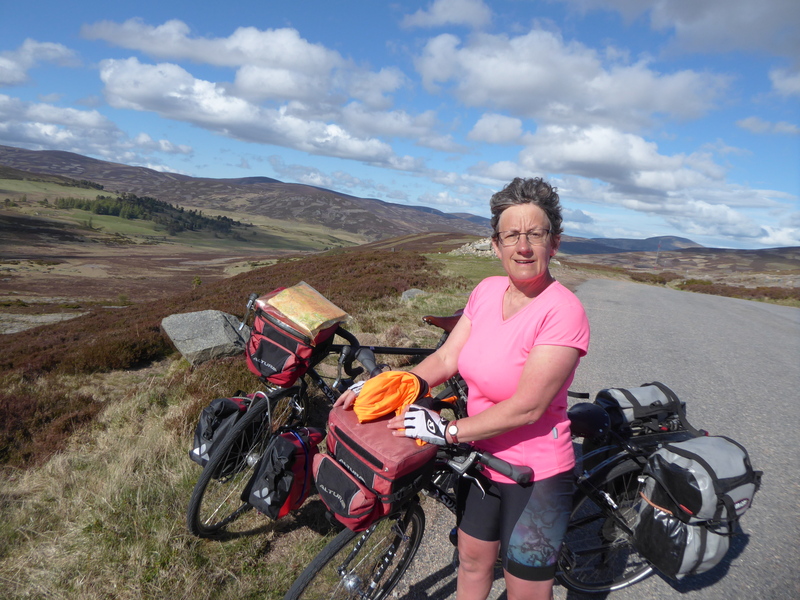 Day 12, Braemar to Archan. 66 miles. 1100m climbing. We did not rush this morning as we were expecting an easier day. We had 2 days blog to catch up in the comfortable hostel sitting room and had our breakfast in the enormous hostel kitchen. We woke to sunshine but our hopes that the wind will have blown itself out were unfounded. As soon as we set off we were straight into headwind. We should have had a few miles of very gentle climb before turning the corner up to the major climb of the day to Cairnwell Pass and the Glenshee ski area. The valley was beautiful but the headwind vicious. Again David headed the wind and I tucked in behind as close as possible. At one point I decided I really should take my turn to head the wind, but that lasted only about a minute as I was almost stationary when it the wind gusted! We plodded on and up, Making more progress when we were sometimes a bit more sheltered from the wind by the turn of a corner – but always knowing as soon as we turned again the wind would buffet our ears so much you could not hear cars coming behind – luckily there were few. The fantastic scenery sustained us and then the site of the summit and a cafe where we pulled in only 8 miles but it had taken us a hour and a half but we were at the highest road pass in the UK at 670m. After a reviving coffee and a rest we layered up for the down hill. It was still a couple of hundred meters ride along the almost flat to the true summit – and after 100m we were putting on more layers and full gloves as the gale whistled over the top. Then 2 miles straight down hill at 13% – and I did not have to put the brakes on once as the wind gave us a very controlled descent! Unlike yesterday the wind was head on and not buffeting us around so it was not too scary. The beautiful Glenshee valley then flattened to a gradual down hill with the wind scale downgraded to ‘windy’ rather than gale force and we could enjoy the scenery and birdlife as we meandered down, the high moorland merging into green farmland. Eventually we turned out of the valley down a small side road to Pitlochry where we picnicked on someone’s convenient garden wall, in a sheltered spot. Then on to the next ‘main road’ but again with hardly any cars. We followed a very pretty river upstream and again the scenery quickly transitioned from farmland to moorland at about 1000ft. 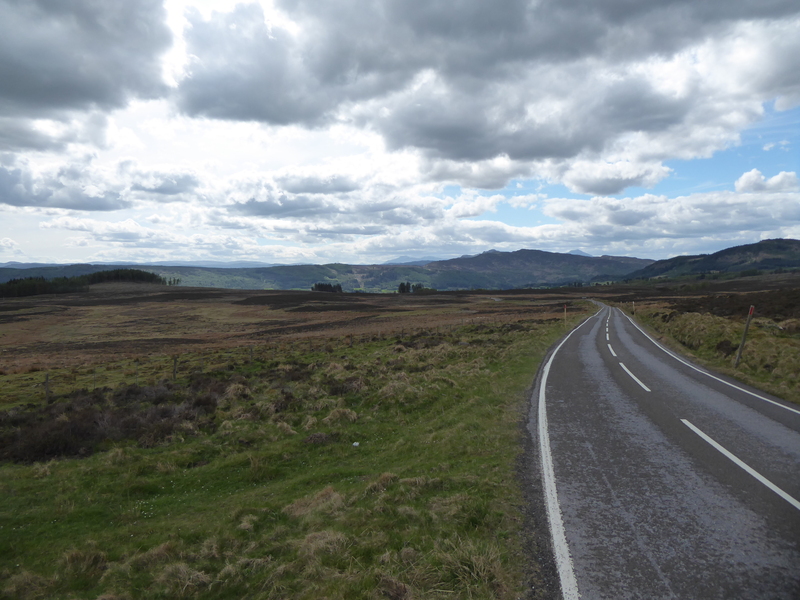 We had been pleased at how we managed the big morning climb but that and the wind had taken it out of us and the climb up and over to Pitlochry, although not very high had my legs feeling very tired. 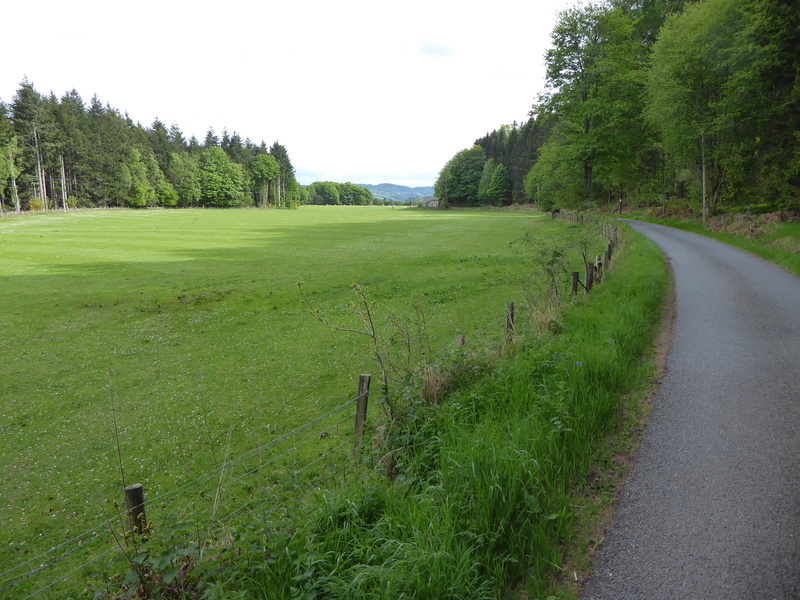 But then it was down, down, down to Pitlochry to below 100m. Time for another tea and cake stop in Pitlochry a pleasant town invented in Victorian times when they put the railway in as a tourist destination. The final stage to Loch Tay took us alongside the Tummel river. The sun was still shining and the wind now down graded to ‘breezy’, although tired legs still felt every little up and down. The banks were covered in blue bells and we were occasionally lasted with wild garlic. We passed some enormous houses, built by the rich for their Scottish playground for hunting, shooting and fishing. 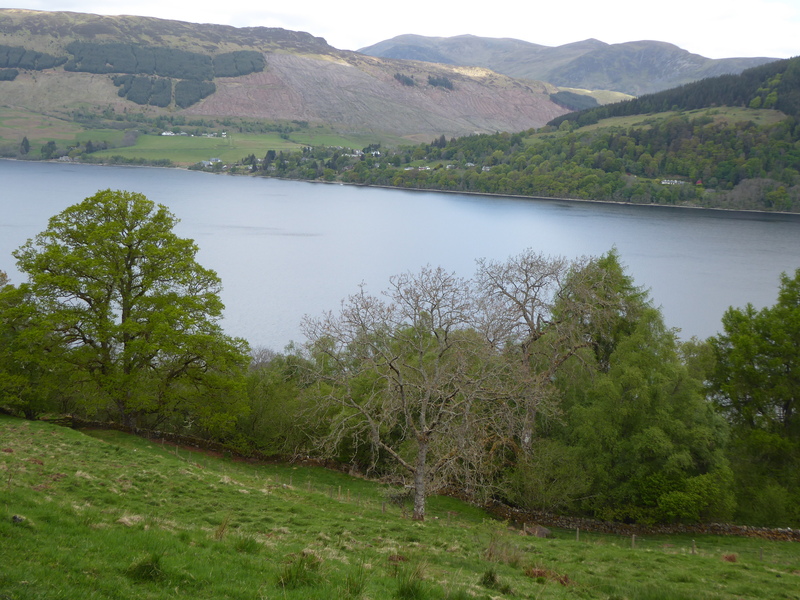 One last hill then down to Loch Tay and our airbnb with Charlotte and Adam, great hosts in a lovely old school house which we shared also with 2 sisters who were just starting a road trip to find their ancestors in Assynt, very near to where we were staying in Inchnadampf. Crashed into bed hoping for a windless day tomorrow! Old familiar route when visiting John’s cousins and Auntie Auto. Watched the salmon leaping at Pitlochrie weir. Dad’s uncle used to work as a ghillie on river Tay!! wonderful area. He used to cart his bee hives up to the heather moorland for the summer with John sitting in the cart alongside the bees. He said he was terrified!! Leg 1 was Bewdley to Venice in summer 2014. Leg 2 was Venice to Istanbul in summer 2015. In May 2016 we resumed our trip from Istanbul going Eastwards and reached Tbilisi, Georgia. 2017 was an enforced "year-off" the main trip but we recorded a 2 week trip around Scotland (just to keep in shape). we are planning the next trip for January/February 2018. Please express your support for children in Bangladesh who are born with club feet by supporting Walk for Life. This charity does fantastic work for children in Bangladesh and we hope those who read this blog will generously support their work. Please click the “Follow” button on this webpage if you want to receive an alerts when we post updates.